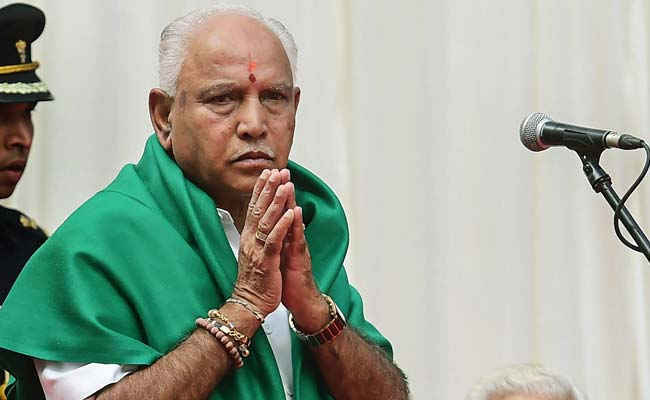 Today further decline of democracy in India was prevented when Mr. Yeddyurappa the BJP CM in Karnataka resigned even not facing the trust vote due to lack of sufficient support. Mr. B S Yeddyurappa was administered oath of Chief Minister ship two days back when Governor invited him to form the government rejecting the claim of JD-S and Congress which had majority number. The behavior of BJP was highly declined, knowing well that it was without numbers, still went ahead to stake the claim for forming the government. Its confidence for remaining gaps of support stemmed from the play of Horse Trading, unfortunately SC bulldozed its aspirations as time frame to prove majority was reduced hugely by the apex court. The role of Governor needs deep analysis. Governor is appointed by President but Governors in India as in this case too take a party line. Karnataka case is its reminder. Unfortunately the constitutional authorities should be more vigilant during the crisis time but they often bring a party tinge in their decisions. This is not a right development for the democratic system of the country. The role of Supreme Court is highly appreciable. It took the right line, first reducing the time for the floor test, second by maintaining the appointment of Pro tem speaker but ensuring transparency by direct relay of the trust vote to the local channels. What is the impact of such immoral political drama for the common people? Common people are still astonished as to what happened and how the Indian political system is being run? Mr. Yeddyurappa talked about farmers and the plight of this section. If he or his associates are really concerned about them then they should establish a Farmers Fund in which all rich should donate, several such fellows belong to his party and from that fund the debts of the farmers be paid. They can do another thing as well; they can apply pressure on their central government to nullify the farmer’s debts. He talked about development of the state. They can now apply pressure on the new regime by constantly pressurizing the new government and central government but he should also reflect on his days when he was CM, the problem of capital city which is under stress in standard urban parameters could have been rectified if he was really a concerned man. These lofty talks have become order of the day for all the political parties. They try to win the hearts of common men and women who are humble and pure at heart but in fact are trapped by these ornamental sayings. Now the next phase will start in Karnataka. That needs to be watched with telescopic eyes as the democratic ideals are weak. SC again emerged the real custodian of these democratic values. Again ruling political party in centre BJP failed to give good governance. It always talked about good governance, when issue of grabbing political power emerged it madly tried to grab it. Karnataka episode is not only a blot on the great traditions of Indian democracy but is also a stain on the political morality of BJP. What political leaders say or do today, have a relevance and impact for the present as well for the future. This is true for all the parties, from national parties to the regional parties.It is observed that most have been involved in disowning the democratic values and tradition in the country, causing immense damage to India as a country. The Karnataka case is recent example. Now the time has come to understand these power hungry politicians, for this the common people need to be together, unfortunately the country has been cleaved by these political parties much, intellectual awareness is too less, hence to understand the real mechanism and power hungry political world is difficult for common people. Still efforts are to be made. Karnataka episode though is sad for all the citizens of the nation who saw the misuse of powers and positions. Now time is to disown such power hungry politicians and leaders. And respect the democratic and selfless politicians. This is the main lesson from the drama which unfolded few days back and conclusion was written few hours back.